12 December 2018 – Thailand’s world-famous cuisine continues to garner culinary kudos with the latest accolades coming from CNN International, with two Thai desserts making its top-50 list. One of them is ‘Mango Sticky Rice’. 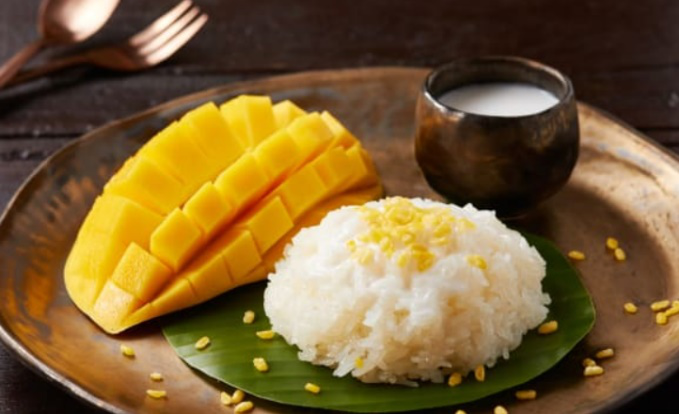 20 January 2019 – Thailand’s tourism industry organizes an attempt at the Guinness World Record for the biggest serving of ‘Mango Sticky Rice’. 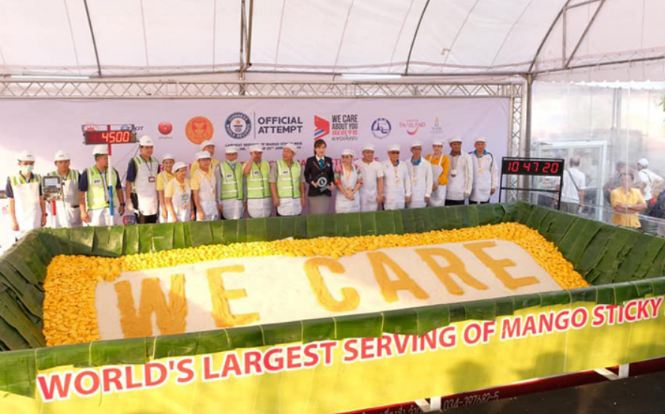 The dessert, containing 6000 mangoes and 15 tons of sticky rice, was revealed to an appreciative public at Lakeside, Muang Thong Thani, in Bangkok. It was declared the biggest of its kind in the world. These two events highlight what has become one of the world’s most popular desserts. Mango Sticky Rice has become an iconic Thai dessert by its popular demand from Bangkok’s famous street-food stalls. It is especially plentiful in March, April and May. This is the peak period for Nam Dok Mai Mangoes – the undisputed King of Fruit for Mango Sticky Rice. It is a long, smooth and curvaceous fruit that is a uniform golden-yellow colour when ripe. Although the Nam Dok Mai harvest peaks from March to May, it is usually available all-year-round. The name Nam Dok Mai means sweet juice of a flower. Some say the aroma of the fruit itself resembles that of daffodils, even though they come from opposite climatic conditions. When these mangoes approach full ripeness, small dots of a sugary substance appear on their skin. First, it is the sweetest mango in Thailand. While the ripe flesh of other mango varieties has a Brix measure of 15-16%, that of Nam Dok Mai has a 17-20% Brix reading. Second, Nam Dok Mai is a larger fruit than all other mango varieties in Thailand. Each fruit weighs from 250 to 550 grams, whereas other varieties may be only 150 to 250 grams. Third, while other types of mangoes have green or red skin tones when they are ripe, Nam Dok Mai has an eye-catching, even golden-yellow skin color. Fourth, the flesh of Nam Dok Mai is the least fibrous of any mango variety grown in Thailand. The texture is smooth as silk, but with a sweet and intense mango flavor. The ripe flesh can easily be scooped from the skin with a spoon. Meanwhile, international trading data shows that mangoes from Thailand are growing more and more popular in markets around the world. The value of Thai mango exports has been climbing steadily, at an annual rate of 15 to 25 per cent, since 2009. However, there was a recent leap in that export value. In 2017, the value of Thailand’s mango exports was US$38.91 million. But in 2018, the figure soared to $63.31 million, a year-on-year increase of 62 per cent, due mainly to huge demand from the Korean market. Growth has also occurred in the Chinese market, although it is still a market in its infancy. In 2009, the total value of mango exports from Thailand to China was just over half a million US dollars. Since then, growth has been maintained at 10 to 20 per cent per year, but with a big leap of 151 per cent from a value of US$2.82 million in 2016 to $4.26 million in 2017. 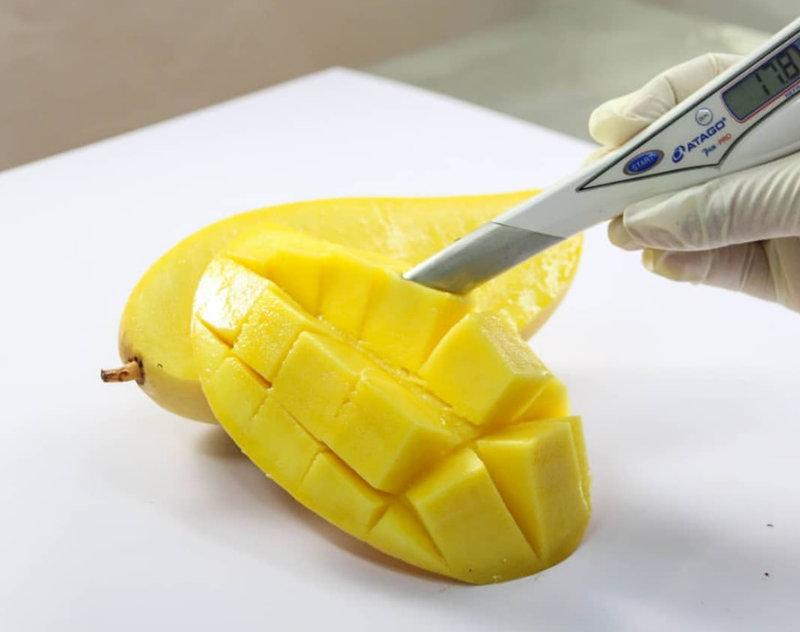 In 2018, the value of mango exports to China reached $4.51 million. This steady growth indicates that Chinese consumers are gradually recognizing Nam Dok Mai mangoes. With a strong marketing effort, Thai mango exports to China are expected to reach a heavy volume within five years. A similar performance has been recorded in other markets. Looking back, the Thailand government first began to promote Nam Dok Mai mangoes in 2009. The succulent yellow fruit were first accepted in Japan, but it took four years of marketing to gain consumer trust. Moreover, the Japanese market was very demanding of the highest standards, which had a direct limiting effect on export quantities. Then, the Nam Dok Mai Mango brand name became known in Korea and, after just a few years, it became Thailand’s biggest market for Nam Dok Mai. A factor that contributed to this popularity was the stable all-year-round supply of good-quality fruit. The outstanding quality of Nam Dok Mai mangoes is now generating an increasing market share around the world, particularly in Korea, Japan, Vietnam, China and Malaysia. Fine-quality mangoes need good care in transport. Some other varieties that are harvested before they are fully ripe are exported by sea, so fullness of flavor is traded off against a long shelf life. But ThaiFarmFresh guarantees that its Nam Dok Mai mangoes travel only by air. They are harvested at full maturity and are at their best for only seven days of shelf life. Because the fruit are tender and delicate when fully mature, each mango needs additional foam-wrapped protection and fits snugly into its own individual ‘nest’ in the box, to ensure that it is not bumped or bruised by movement in transit. 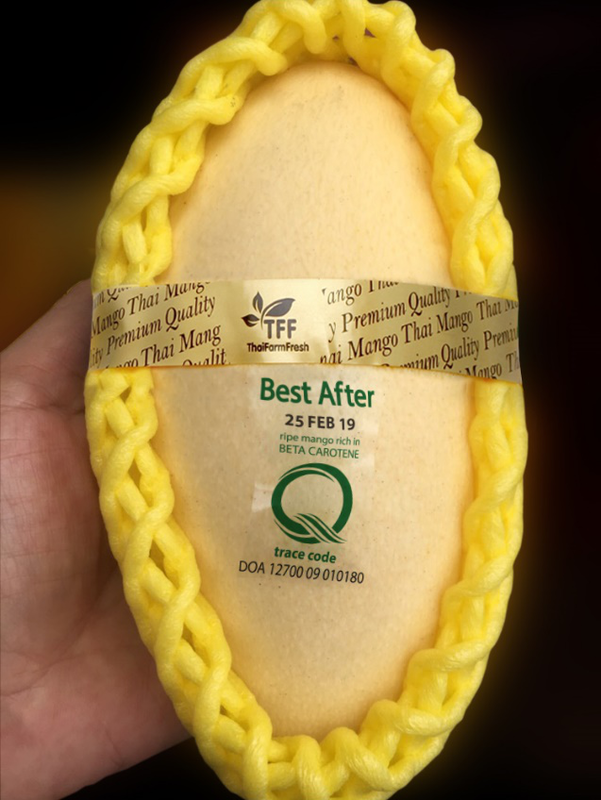 ThaiFarmFresh takes extraordinary care to ensure that its Nam Dok Mai mangoes are delivered at peak freshness, ripeness and quality. But workers who give special care, better-designed transport cartons, foam-wrap protectors and travelling only by air makes the cost of Nam Dok Mai mangoes higher than fruit of lesser quality whose flavor suffers because it is picked before maturity and shipped by sea. Therefore, the finest mangoes in the world come at a premium price. However, Nam Dok Mai mangoes are a special treat; they are nature’s ultimate luxury, and just once in your lifetime, you should demand the best. It is well worth it. ThaiFarmFresh is a brand for Chinese consumers. Its parent company is NIRVANA. The parent company has been supplying OEMs of Nam Dok Mai to Korea for 10 years. The annual Nam Dok Mai mango supply to the Korean market is about 1,800 tons, and China is about 200 tons. Compared to the Korean market, NIRVANA believes that the Chinese market will have more potential in the next few years. 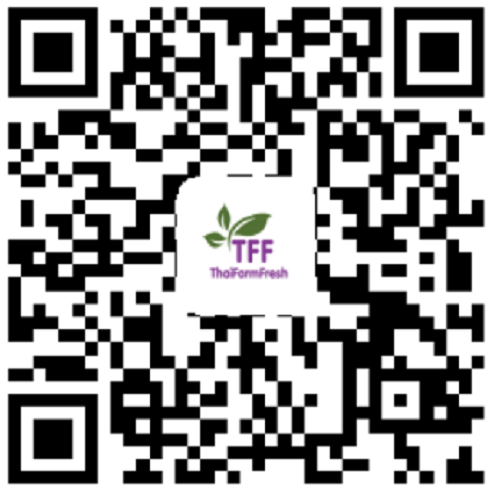 For purchase needs, please contact sales@thaifarmfresh.com or scan the QR code below by WeChat.